If you own a home or a commercial property in Putnam County, NY, you may be putting your family or employees at risk from a hidden danger: Asbestos. Found in almost every building erected since 1978, asbestos can cause cancer, mesothelioma and Asbestosis and must be removed as quickly as possible. We can help. We have been in the business of asbestos remediation (site cleanup) and abatement (removal) in Putnam County, NY for more than 25 years. Insulation and siding, flooring tiles and roof shingles, sheetrock and plaster all contained asbestos –even those common “popcorn” ceilings found everywhere in Putnam County—well into the 1970’s. No one knew the danger. As the materials age, they release invisible asbestos fibers into the air and enter the lungs of those exposed, causing illness and even death. So how do you know if asbestos is in your home or building? 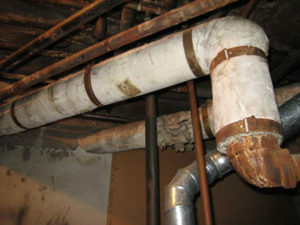 Air sampling is the only way to detect asbestos and we send in an independent testing firm to check. Our certified, licensed and insured team of experienced techs show up on site as soon as asbestos is detected. A decontamination zone is established with negative air machines ensuring no more asbestos gets released into the air during abatement. All asbestos is chipped and scrubbed away, then disposed of off-site. Exposed areas are sealed and the entire zone carefully cleaned, using special filtered equipment during remediation before the air is tested again. Only when no asbestos is found in the air and we deem it perfectly safe, do we allow your employees or family back inside the building. Asbestos abatement and remediation consultation is available in Putnam County, New York by calling (877) 645-1428.